Dromore Amateurs are back in the Championship are are gearing up for the new season under new boss Davy Welshman. There doesn’t seem to be any hangover at Dromore Amateurs Ladies. After suffering relegation from the top table of Northern Irish women’s football last year, they’re itching to get going again. The Dromore girls are ready for the big kick-off. With a new coach at the helm, they begin their Championship campaign against Armagh City Ladies at Dromore Leisure Centre on Wednesday evening (kick-off 7.30pm) and the new chief says they’re not getting bogged down by a desire to bounce back at the first attempt. “The gulf between the Championship and the Premier League is huge,” explained new boss Davy Welshman. The side captained by Tracey Orr begin their campaign against an Armagh side that they will be familiar with, not least ex-Dromore duo Danielle Craney and Laura McGrath. 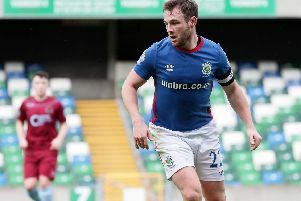 The former Linfield and Newry coach has a youth international at his disposal in Niamh Ruddy. He has also added his own players to the squad over the close season and isn’t ruling out further additions. “Niamh has fantastic potential. We are hoping that she will progress through into the senior internationals. The new boss has been putting his players through their paces since arriving in February but rarely without a ball at their feet. “The girls are working really hard in training and when a new manager and new coaches come in there is that buzz,” he said. “I think the place gets a wee bit of a lift because invariably it is new ideas. The ladies usually train at Dromore Community Centre on Mondays 7-8:30pm, and new players are always welcome.